Exciting, challenging and a new experience for many, sailing is now widely enjoyed as a cost effective means of Corporate Entertainment for a fun race, team building / motivation day or networking with clients / suppliers and our choice of luxury yachts from cruising to racing will suit your needs and maximize your sailing enjoyment whether as a group of 6 or 60. Our Corporate Yacht Charters start from £750 plus vat per day and are fully inclusive of skipper, foul weather gear, fuel, light refreshments and all Marina fees. We can discuss lunch options: Pub, Restaurant such as our favourite Mojacs for small groups or set menu for party’s up to 30 clients, The RORC for bbq or seated at the ‘Captains Table”. Whatever the needs of your corporate entertainment day, we can recommend the most appropriate yacht to charter for comfort or exhilaration, with the option of using a RIB for some of the time which is ideal for larger corporate groups. During their day on the water, your guests will have the opportunity to safely participate at a level they feel comfortable with, whether complete novices or seasoned sailors. Their skipper gives a full safety briefing once aboard the yacht before leaving harbour and provides expert tuition and support during the day. 0900 – Guests are greeted by their Four Seasons skipper and have a chance to get to know one another over a breakfast of bacon rolls, coffee and juice. 0930 – Aboard their yacht, your guests are fully briefed by the skipper on all aspects of boat safety and the itinerary for their days cruising is discussed. 1000 – Depart Portsmouth harbour for a leisurely sail to Cowes on the Isle of Wight. Your highly experienced Skipper will actively ensure your guests have the maximum enjoyment from their days sailing. 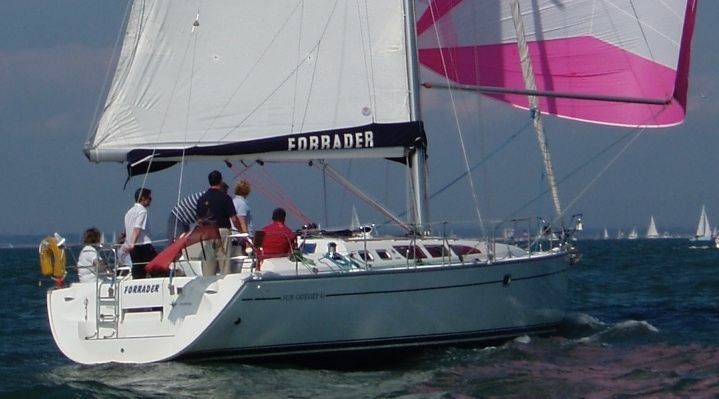 Guests can participate in helming the boat, raising and trimming the sails or sit back and enjoy the magnificent Solent views. 1300 – Arrive in the picturesque town of Cowes, steeped in sailing history with all the famous Yacht Clubs. We can arrange lunch in one of Cowes excellent restaurants, historic pubs or on the Captain’s table at the RORC. Alternatively a three course buffet lunch of cold meats, fish and salads with wines and cheeses can be enjoyed aboard. After lunch a chance to explore Cowes before setting sail. 1500 – During the return sail to Portsmouth harbour guests can practice their sailing skills or relax after an indulgent lunch! 1700 – On arrival back at Portsmouth a chance to discuss the days sailing over a drink in the Marina bar before departure. Why not combine your corporate yacht charter with a RIB? The whole group meet for a social lunch then swap boats for the afternoon, the best of power and sail all in one day!! Please see our testimonials page for client feedback of our events or contact us for further details.